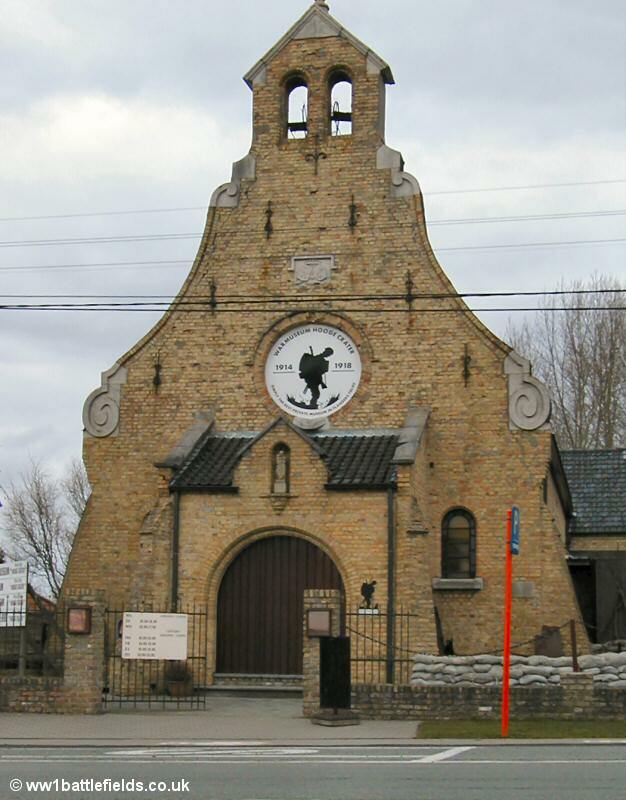 The village of Hooge is about two miles east of Ypres, on the main N8 road that leads to Menen. The front line of the Salient was here in 1914 and there was fierce fighting in the area over the next three years, during which the village was totally destroyed. 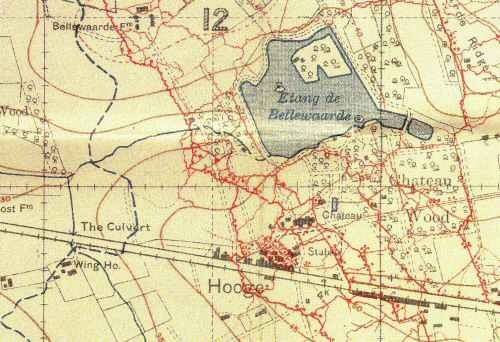 The map below shows the location of Hooge and the sites of interest in and around it. 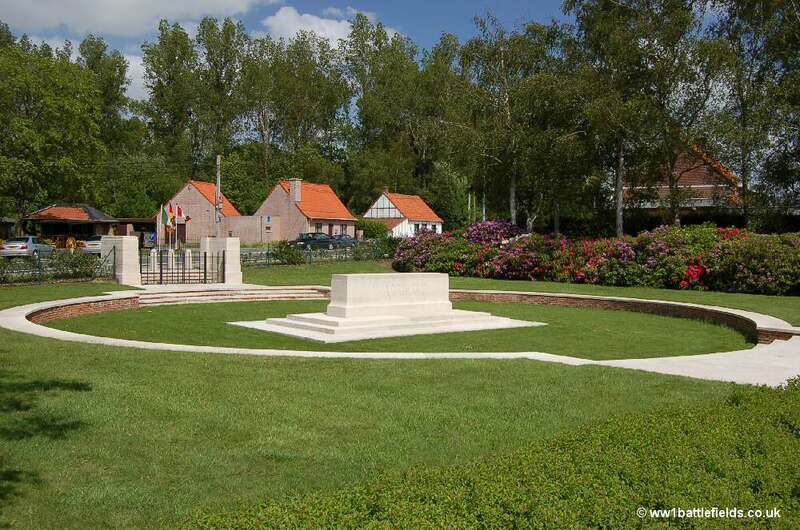 This page also covers sites located near to Hooge, including Railway Wood, the Princess Patricia’s Canadian Light Infantry Memorial and Birr Cross Roads Cemetery. The Holt’s Battlefield Guide to the Ypres Salient covers Hooge and surrounding areas as well as the rest of the Salient. 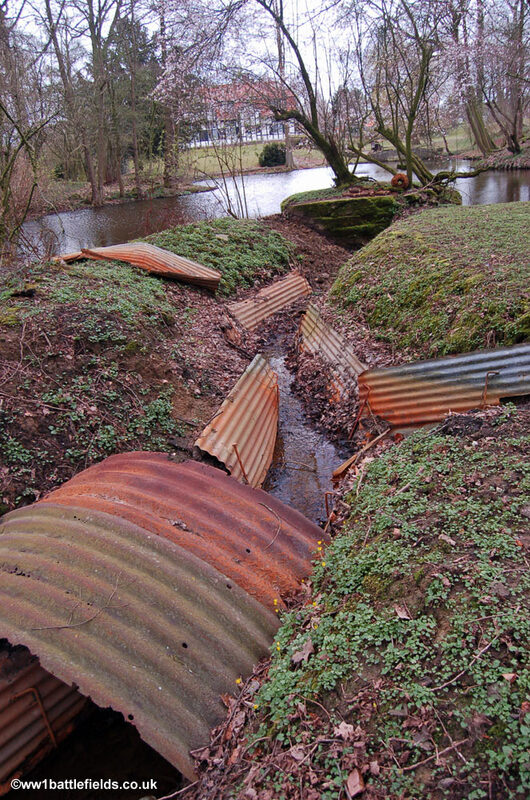 For those who enjoy walking the battlefields, a great way to really see the ground, there is an excellent walk starting from the Museum at Sanctuary Wood which also takes in Hooge, in Paul Reed’s Walking Ypres. 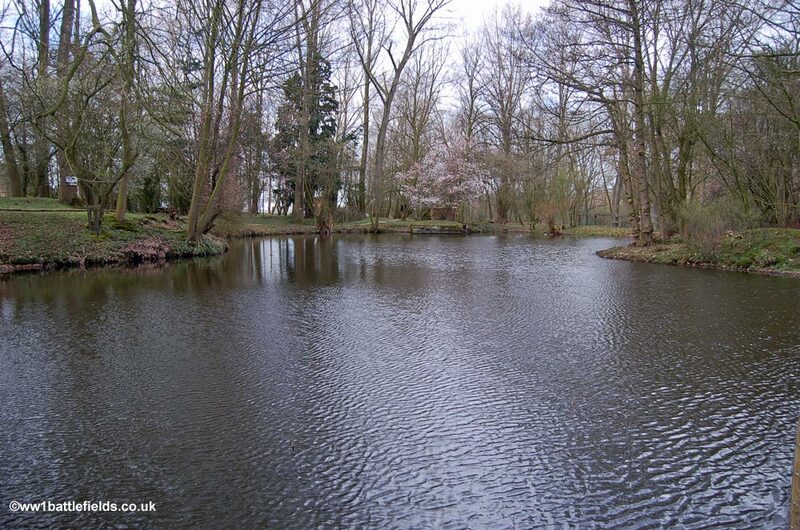 A large crater was blown at Hooge in July 1915. This was a relatively quiet period on the British part of the Western Front, when few major assaults were made. 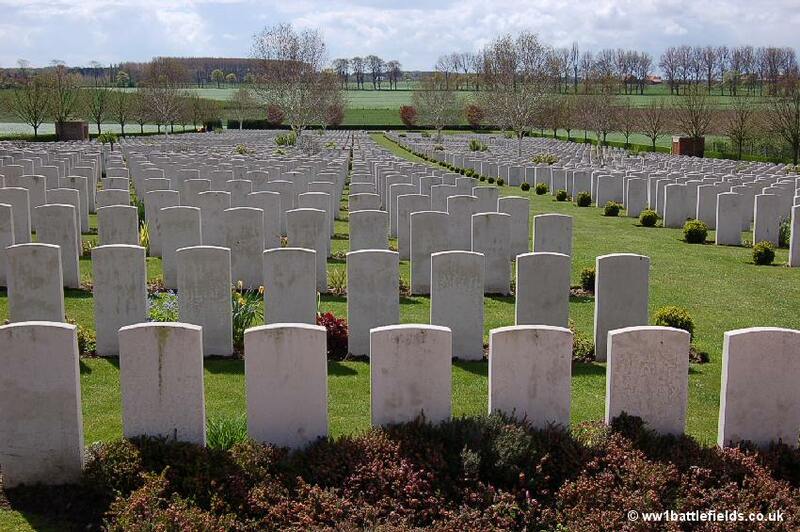 However, the average casualty rate for the British and Commonwealth forces was around 300 men per day. 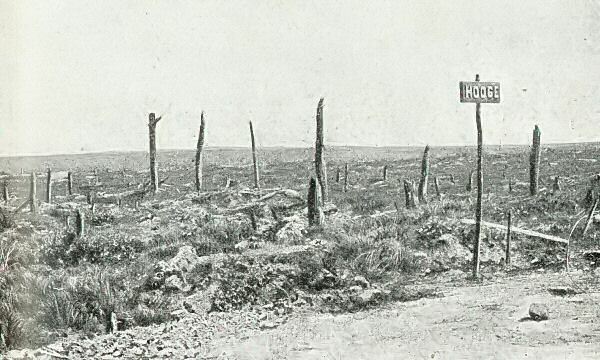 Hooge, having been earlier lost, had been retaken in May 1915. 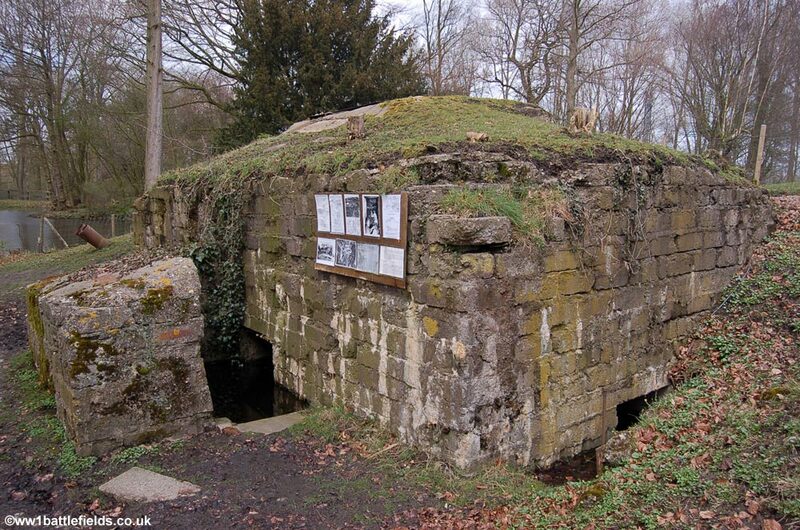 Lieutenant Geoffrey Cassels was the officer in charge of tunneling and laying the mine at Hooge. The 175 Tunnelling Company completed the work in just five and a half weeks. 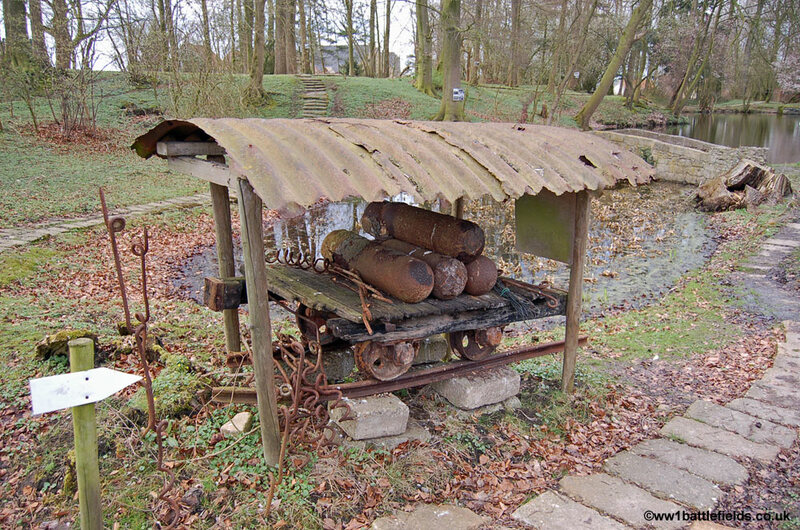 Compared to the months of preparation before the mines used in the Battle of Messines in 1917, this was quick work. The first attempt at tunnelling for the mine, starting from within a stable, failed, because the earth was too sandy. 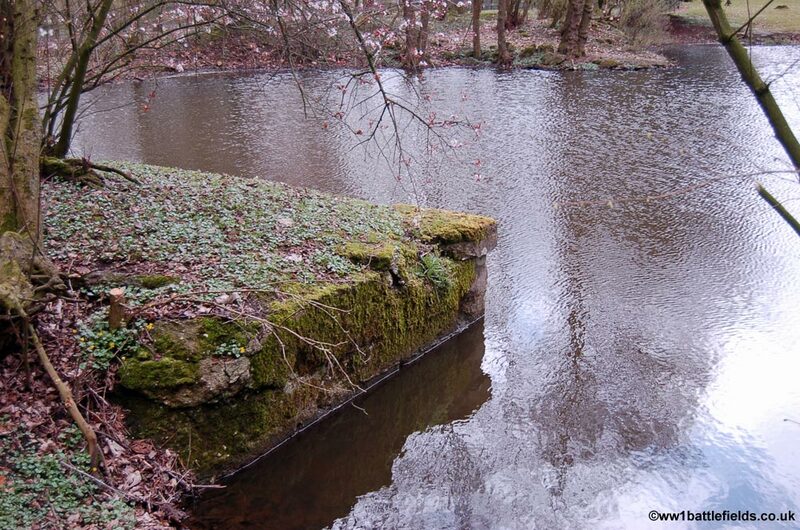 A second shaft was sunk from the ruins of a gardener’s cottage nearby. The tunnellers reached blue clay, and made good progress. The main tunnel was 190 feet long, with a branch off after about 70 feet, this second tunnel running a further 100 feet on. 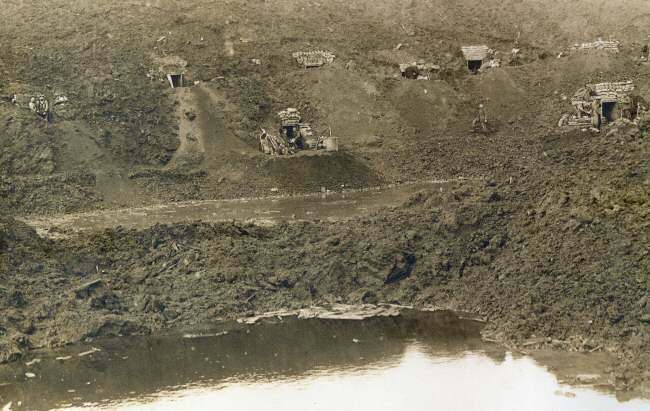 The intention was to blow two charges under concrete fortifications which the Germans were constructing, although the smaller tunnel was found to be somewhat off course. The mines were laid using the explosive ammonal, as well as gunpowder and guncotton. 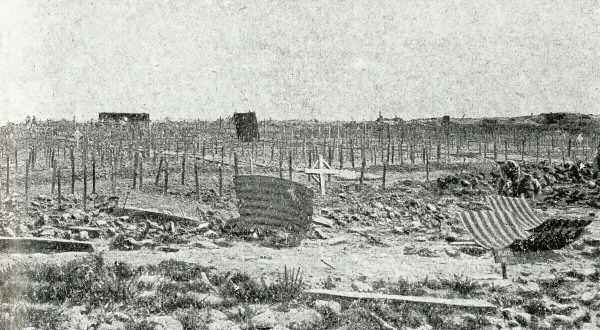 The largest mine of the war so far was blown on the 19th of July at 7 p.m. – but not before a German shell had severed the detonator wires only a few minutes before. They had to be rapidly repaired. The crater made was estimated at 120 feet wide and 20 feet deep. The crater was captured by men from the 1/Gordon Highlanders and 4/Middlesex. Ten of the latter were killed by debris from the mine as they waited in advanced positions. Lt. Cassels was almost arrested shortly afterwards because of this, although subsequently he was awarded the Military Cross, and praised for his efforts. The German losses from the mine were estimated to be several hundred. 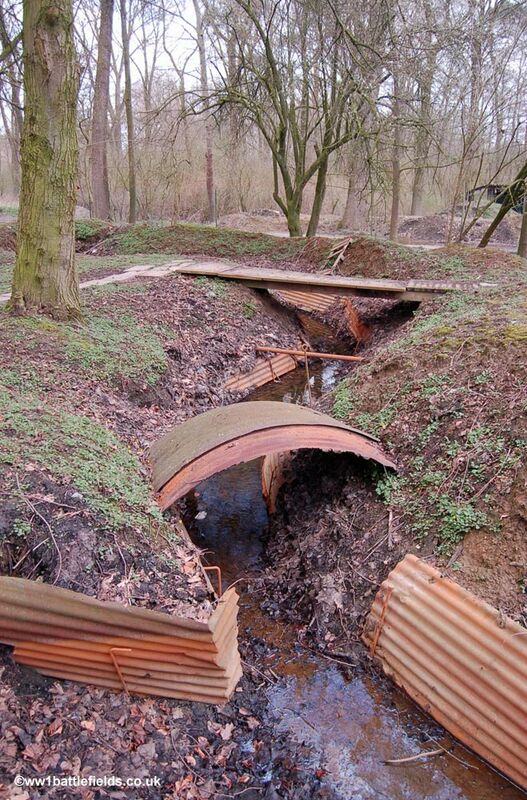 The two photos below show craters at or near Hooge during the War. Both are German photographs, and the left one dates from 1915. 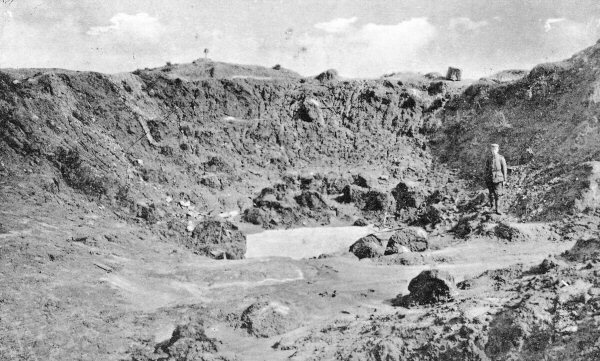 The date of the second is unknown, but shows dugouts in the side of the crater, as well as the water filled base. The crater is now in the grounds of a hotel (the Kasteelhof ‘T Hooghe), but you can enter the site of the crater and walk part way around it. The crater (now water-filled) is quite large, and there are also pillboxes positioned around it, one of which is now partly submerged at the edge of the crater, and inaccessible. There is a suggested route to follow, and around the back of the crater are some shallow trenches, which from GPS overlays with modern and trench maps do seem to line up quite well with wartime trenches. There are also a number of information boards positioned along the suggested walk, and these give background on the area and also show Hooge Chateau before the war, as well as the area just after the war, including a picture of the nearby Hooge Crater cemetery (see later on this page). Just behind the crater, with the fence visible from the crater site, is a the Bellewarde theme park, which stands on the site where Hooge Chateau used to stand before it was destroyed in the War. The current building here housing the hotel is more or less on the site of the stables which once stood here. On the 30th of July 1915 at Hooge, the Germans first used the flame thrower in battle. At 3.15 a.m., jets of flame from these flammenwerfers swept across the trenches occupied by the 8th Rifle Brigade. Not surprisingly, the Germans with the advantage of this new weapon (also known as liquid fire) made gains where it was used. There was desperate fighting, with the sides separated by only a few yards. A flammenwerfer can be seen in the museum at Zonnebeke (see the Passchendaele page for information). The crater and the Chateau were again retaken by the British in early August 1915, but changed hands again several times before the war ended. The ground here was truly stained with the blood of many battles. Just a few yards away, on the other side of the road is Hooge Crater Cemetery. This is a large Cemetery with 5,916 burials overall, as well as special memorials to men known, or believed to be buried here, and to some whose graves in other cemeteries were destroyed by shellfire. Over 3,500 of the burials are of unidentified soldiers. 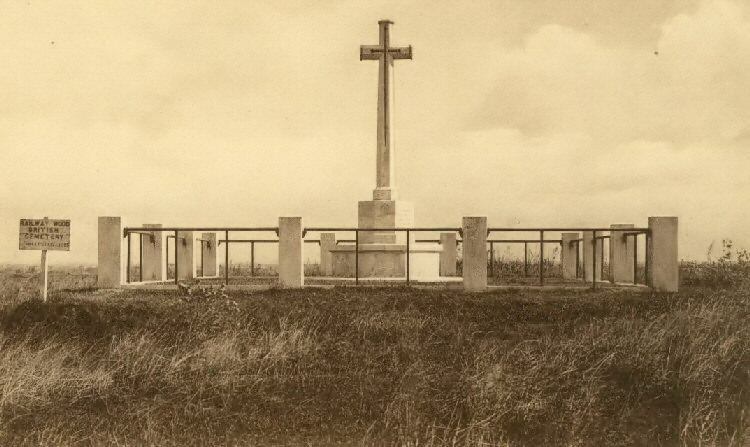 Below is a photo of the cemetery perhaps in the 1930s, along with a similar view today. In the early photograph a train or tram line can be seen running in front of the Cemetery. 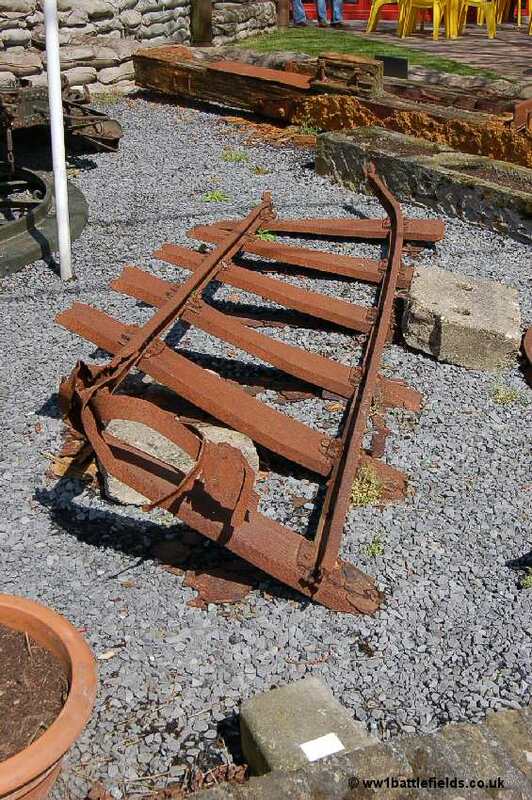 A light railway ran here during the war as well. The cemetery slopes downhill away from the road, with the graves mainly in a regular layout. 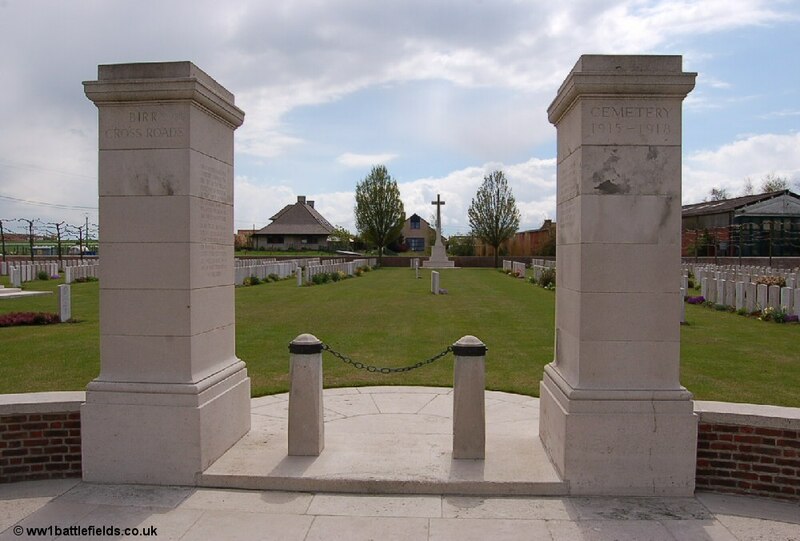 The circular depression at the front of the cemetery is meant to represent the crater from the mine blown here in 1915, and the Stone of Remembrance is located in this depression. The original cemetery was started in late 1917, and these graves are now Plot, located at the top and nearest the road. 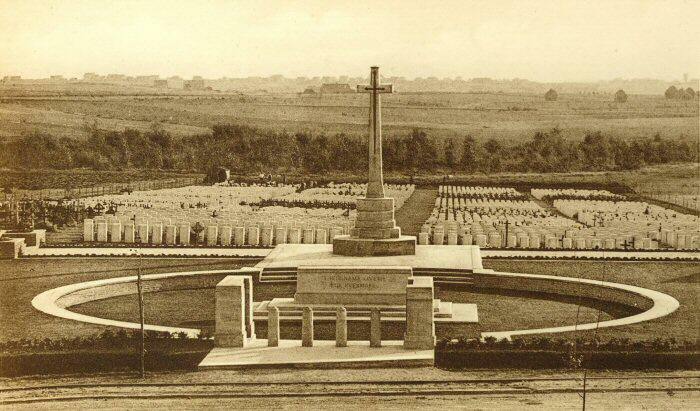 The cemetery was greatly enlarged after the armistice by the concentration of graves from sites around. The left picture below shows the Cemetery just after the War, and the right picture Plot 1 today. Walking through this large cemetery, one is struck by the numbers buried here. And there are more burials than there are headstones. In Plot 6 for instance there are a number of headstones for three, four or five unknown soldiers. 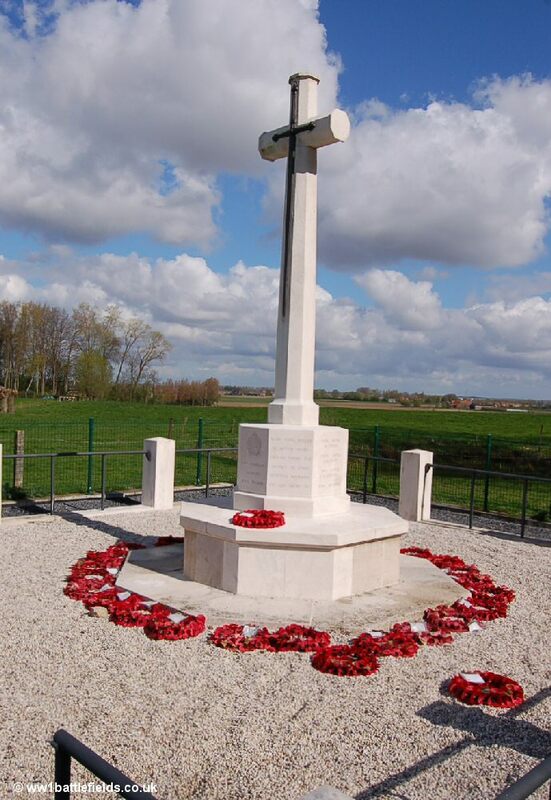 Just across the road from the Cemetery is Hooge Crater Museum. This is housed in what was a chapel, built just after the Great War in 1920. By the 1990s, this had fallen into disuse, but was saved by the De Smul-Ceuninck family, and today is an excellent museum. Entry is €5 per adult, €2 for children. The sculpture which can be seen above the door was carved by John Bunting in memory of Private Joseph Bunting of the Royal Fusiliers who was killed on the 1st of July 1916 on the Somme. 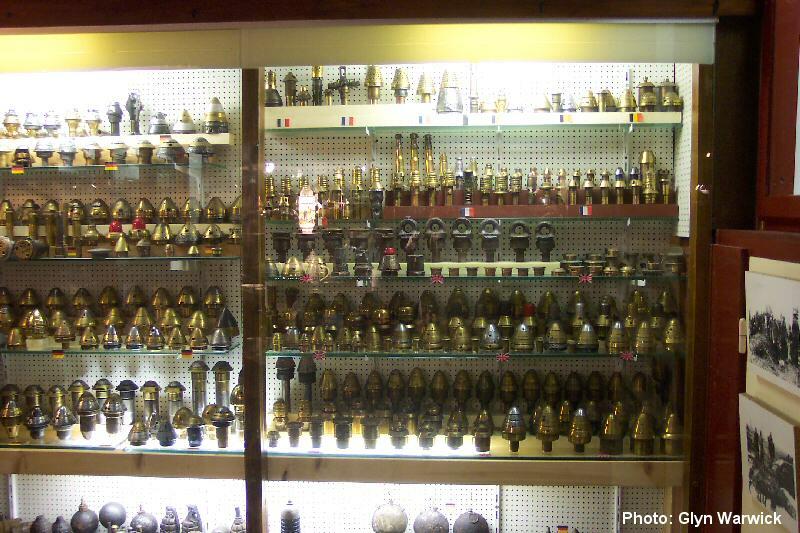 The museum contains a number of good displays, including uniforms, armaments and relics from the Great War. 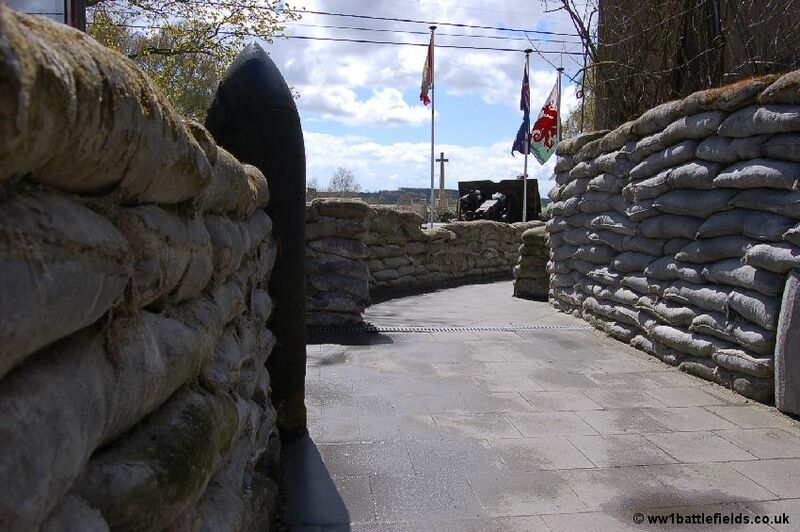 Outside, the entrance way has been lined with sandbags to give the appearance of a trench, and guns and a portion of twisted rusting railway track, presumably dating from the war, can also be seen. 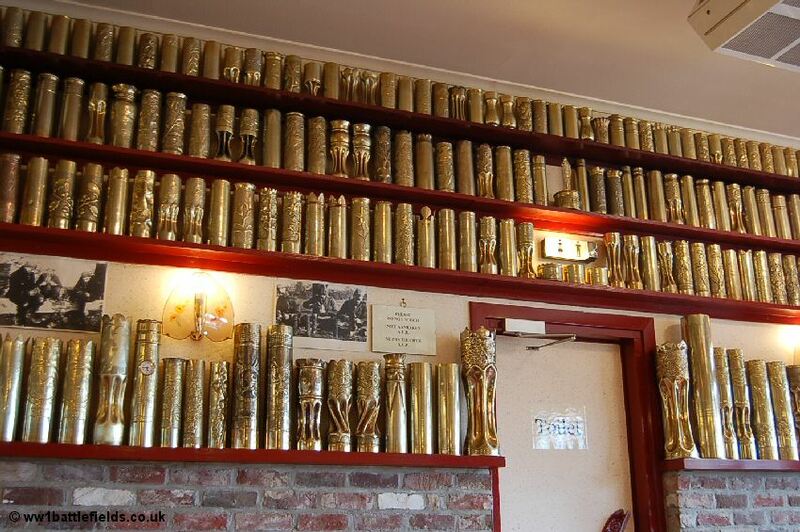 There is also a cafe here, where many highly polished shell cases, often in the form of trench art, line the walls. This is a good place to stop for refreshments when visiting the area. A little further along the N8 towards Menen, there are large car parks on the left hand side of the road for the Bellewaerde theme park. Colourful flags line the road, and flutter in the breeze. 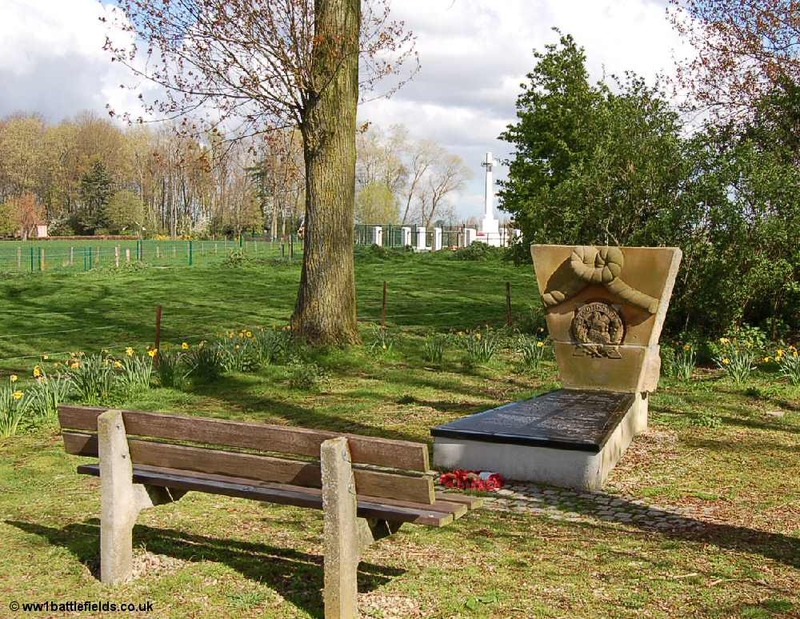 In between the flags, also on the left hand side of the road and at the edge of the car park, is the memorial to the Kings Royal Rifle Corps. 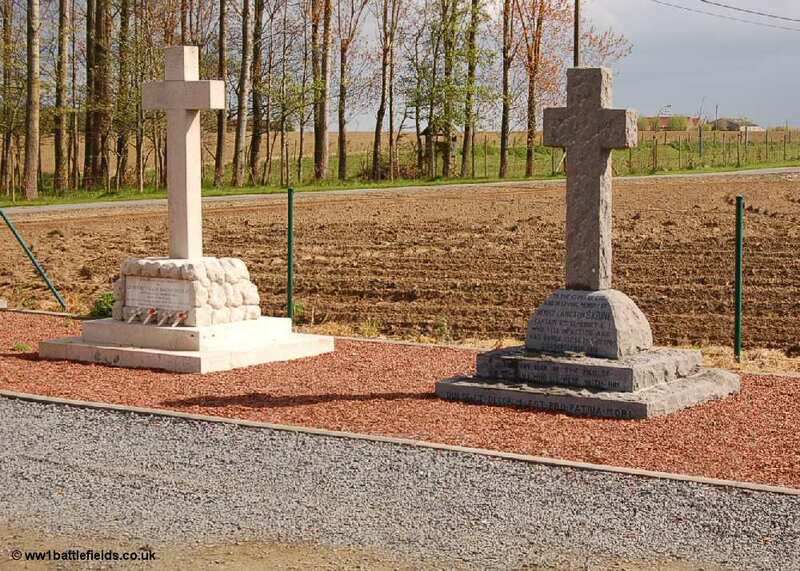 The memorial is very similar to another for the KRRC, located at Pozieres on the Somme, although the small columns which once stood around it are now gone – these can be seen in an earlier picture, above left, probably from the 1930s, long before the theme park. 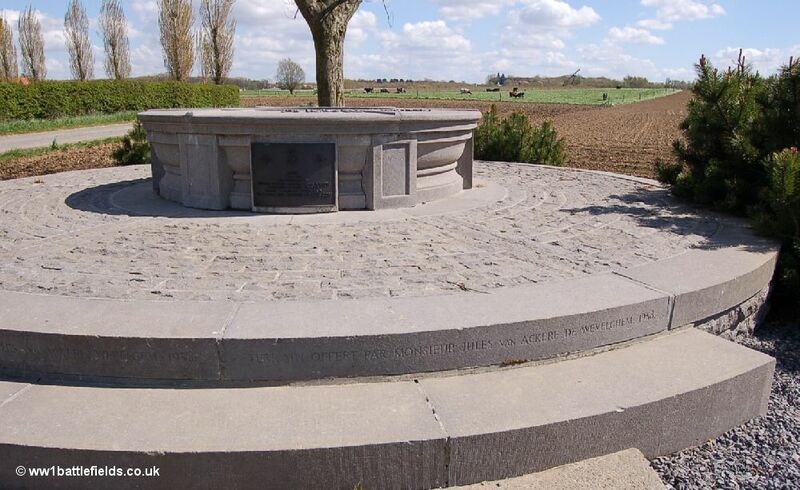 The inscription on the memorial commemorates officers and men from fifteen battalions of the KRRC who died in Flanders ‘in the cause of liberty and justice‘. 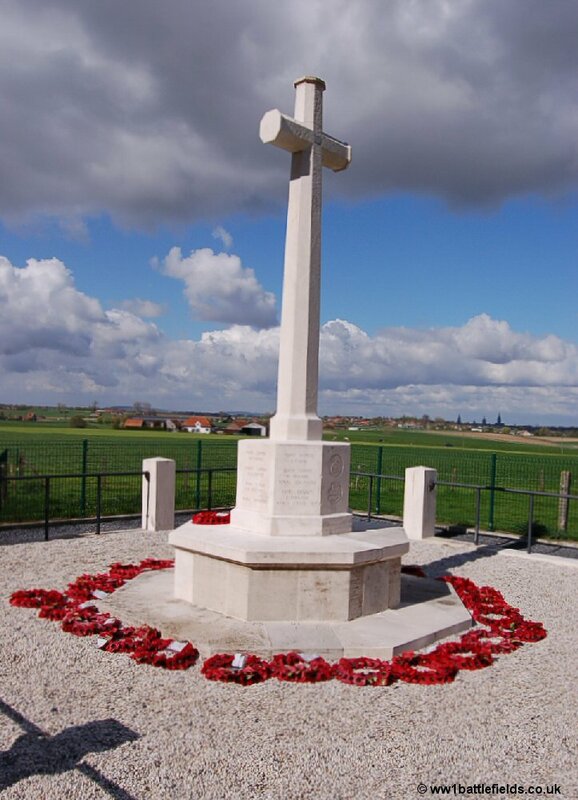 This site is located a little north of Hooge. 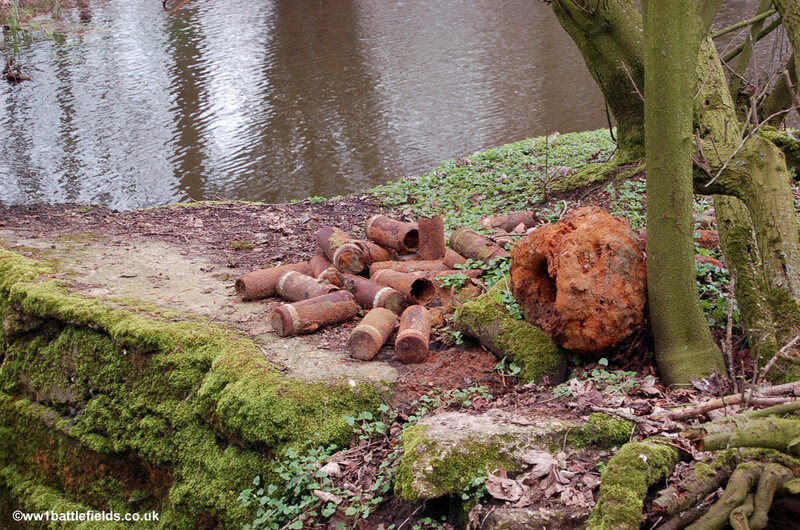 From Hooge Crater, head back along the N8 toward Ypres. Take a right turn, following a green CWGC sign to R.E. Grave, Railway Wood. Turn right again just before a small wood, and the site is visible in the fields off to the right of this road. A bar is in place across the track leading to it, but the walk is a short one. The R.E. 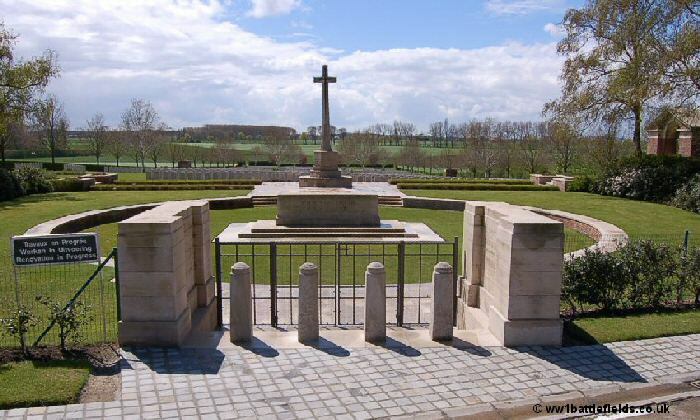 Grave is a memorial to a number of Tunnellers who were killed here between December 1915 and July 1917. These men were buried underground and their bodies never recovered. So there are no headstones here, but there is a Cross of Sacrifice showing the site is under the control of the Commonwealth War Graves Commission. 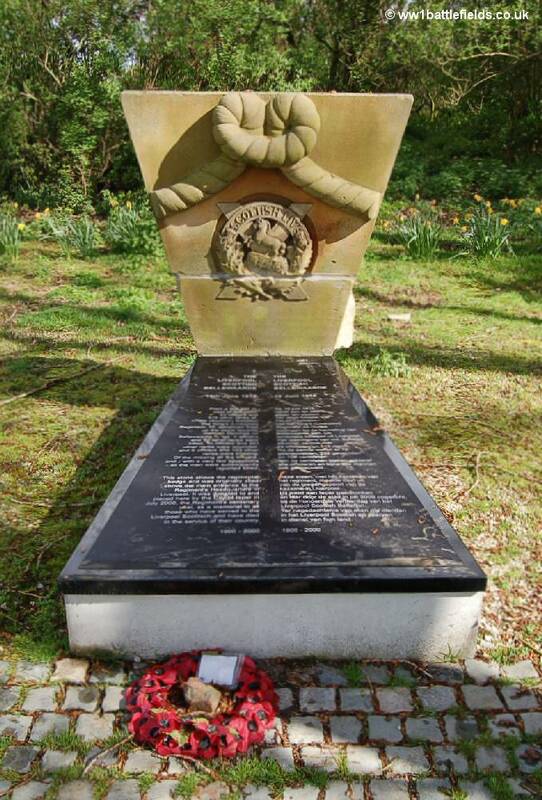 On the octagonal base of the cross is inscribed: ‘Beneath this spot lie the bodies of an Officer, three NCOs and eight men of or attached to the 177th Tunnelling Company Royal Engineers who were killed in action underground during the defence of Ypres between November 1915 and August 1917‘. The officer buried somewhere underground here is Second Lieutenant Charles Geoffrey Boothby, from near Birmingham. He was only 19 when he applied for a commission in December 1914, and only 21 when he was killed on the 28th April 1916. He had only recently been attached to the 177th Tunnelling Company from the South Staffordshires. The telegram announcing his death was sent to his parents, but they had moved. When it was sent on to them, his father telegraphed the War Office back saying “I cannot think it true please confirm”. Sadly, it was true, and in June 1916 a further communication added that his body had not been recovered. The human tragedy that rippled out is clear. In June 1916 his mother wrote from Cornwall, where her husband had been recuperating following illness. In February 1919, relating to delivery of Boothby’s plaque and scroll, she wrote “my husband has died since my dear son was killed”, and apologises for a delay in answering the letter, as she has herself been ill. 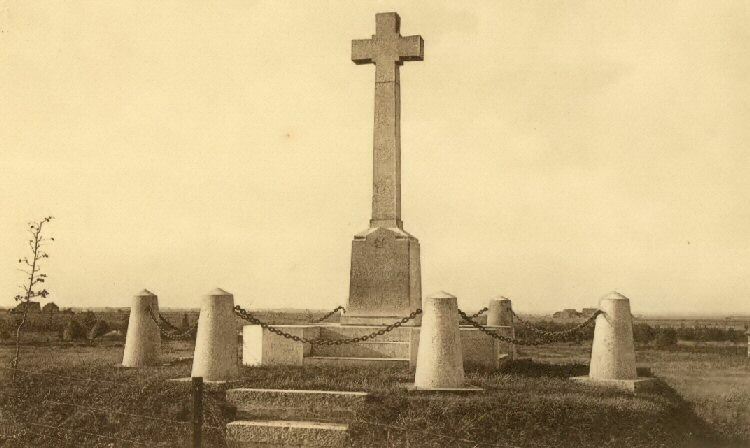 The names of the men commemorated here are inscribed on the sides of the base of the cross. As well as the insignia of the Royal Engineers, there is also the insignia of the Royal Welch Fusiliers and The Kings Liverpool Regiment – these being regiments from which men had joined the 177th Tunneling Company. The R.E. Grave is a CWGC war grave site, listed on their database, but the dates of death of the twelve men listed do not match those given on the inscription for reasons unknown. 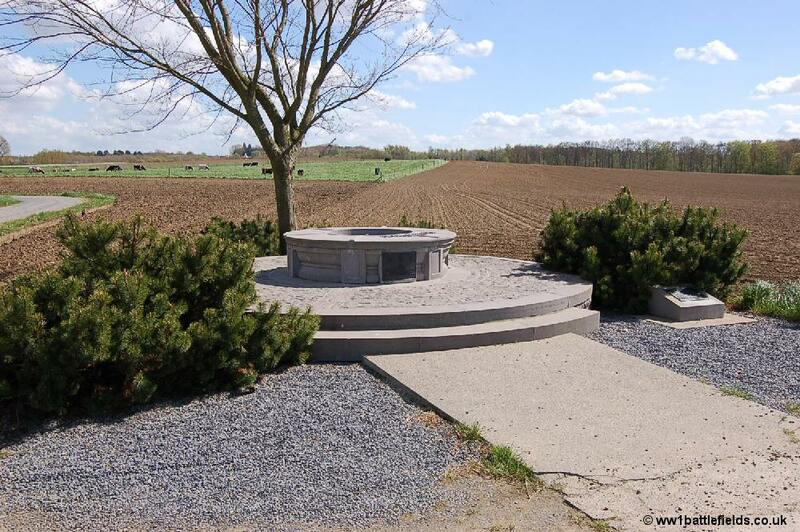 It is a lonely spot, and a crater can be seen right next to the memorial. The path continues past the memorial and the wood, and at the edge of the wood is a memorial to the Liverpool Scottish. There is a bench positioned in front of the memorial, and in spring daffodils bloom around it. More craters in the wood nearby can be seen, and in the right hand picture below the RE Grave can be seen behind. Leaving Railway Wood, a little further north along the road crosses the N37. Continuing on, on the right hand side after it crosses the N37 are two private memorials to officers killed nearby. These are memorials to Captains Geoffrey Bowlby and Henry Skrine. Although these memorials today stand side by side, the men they commemorate are from two different regiments. 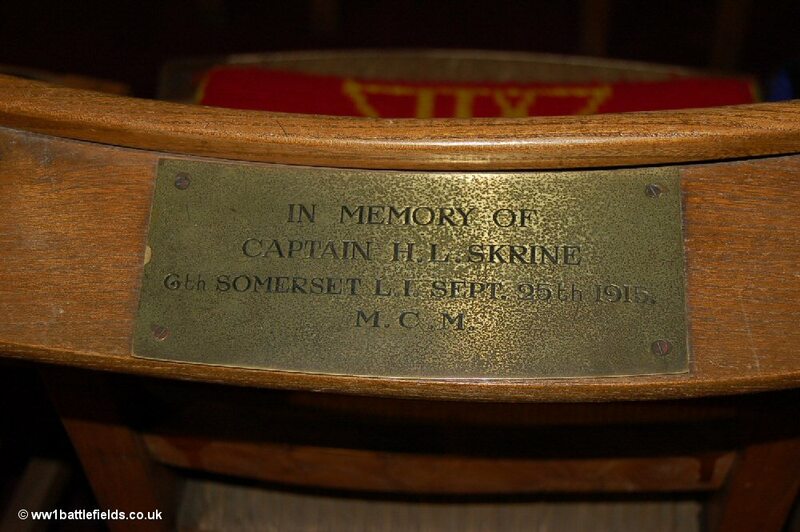 Skrine served with the 6th Somerset Light Infantry and Bowlby with the Royal Horse Guards. And although both died in 1915, their deaths were months apart, in September and May 1915 respectively. 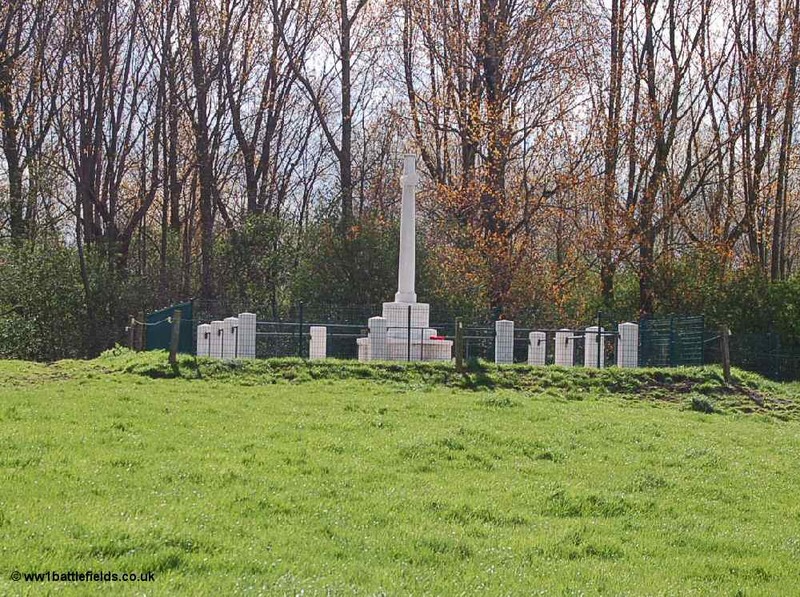 The memorials in fact used to stand about 100 yards apart, with Bowlby’s memorial further into the field rather than by the roadside as it is today. 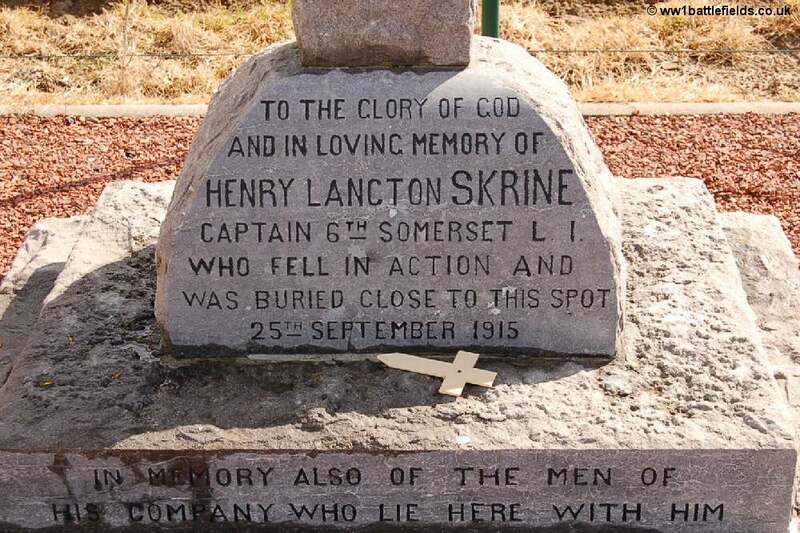 The inscription at the base of Skrine’s memorial (above right ) states that he was buried near this spot, and that the memorial is also to honour those of his company who lie with him. Both Bowlby and Skrine have no known grave, and their names can be found on the Menin Gate in Ypres. 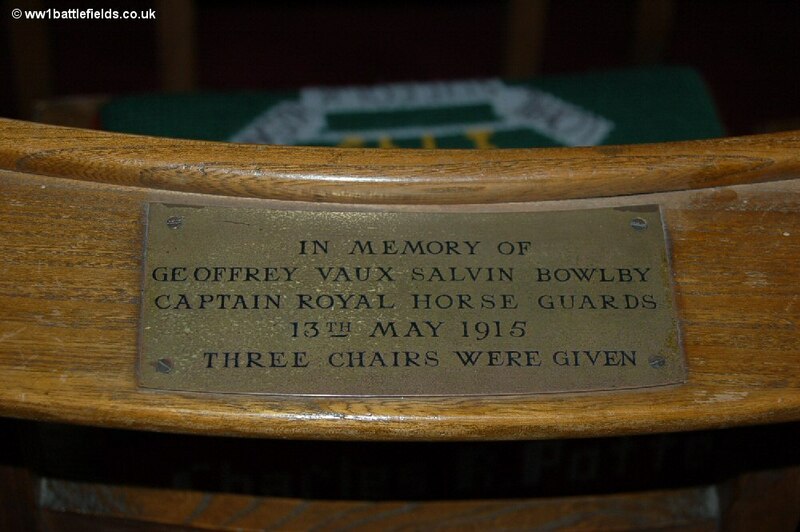 Their names are also to be seen in St. Georges Memorial Church in the town, where they are two of the many who have their names inscribed on chairs within the church (see photos above). Returning to the main road and turning left along the N37, the next right turn leads to a memorial to Princess Patricia’s Canadian Light Infantry. The memorial is actually located on a road named Prinses Patriciastraat. It is reached by very small roads, but is signposted. 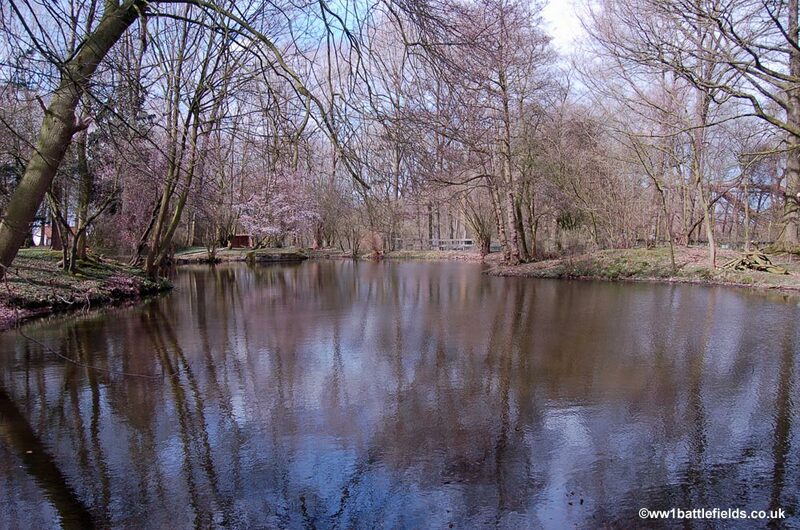 The land for the memorial was donated in 1958 by Monsieur van Ackere de Wevelghem. The memorial was unveiled on the 13th of August 1964, by Mrs. Hamilton Gault. She was the wife of the founder of the regiment, Major Hamilton Gault, and the date marked the fiftieth anniversary of its founding. The PPCLI had trained on Salisbury Plain. They landed in Le Havre just before Christmas, 1914, and were based in the Salient in early 1915. 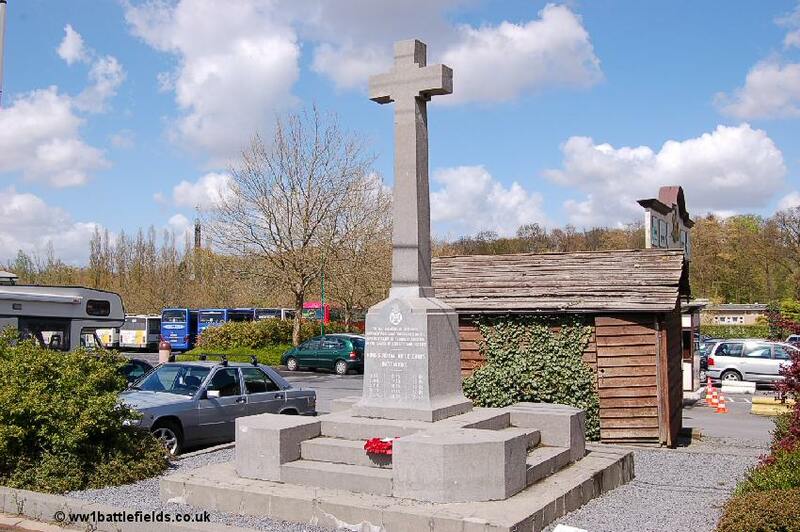 On the 8th of May 1915 they were involved in the action which is commemorated by the siting of the memorial here. At 4 a.m. that day the Germans started shelling their positions, and about 90 minutes later they attacked. Two or three German machine guns swept the trenches, and the situation was so serious that even signallers, orderlies and servants were ordered to take up arms and man the support trenches. Major Gault himself was injured by shell fire in his left arm and left thigh at around 7 a.m. They were forced back, but attacked again at about 9 a.m., and the fierce fighting continued, suffering many casualties . The PPCLI were reinforced by men from other battalions in the line nearby, including the 4th Rifle Brigade. In the afternoon the Germans again tried to take their trenches, but the PPCLI hung on with grim tenacity, and were relieved at 11.30 p.m. that night by the 3rd Kings Royal Rifle Corps. The PPLI War Diary records that the KRRC men ‘gave us assistance to bury our dead that were in support and communication trenches as it was impossible and imprudent to reach the fire trenches‘. Lieutenants Edwards and Crawford were killed, and Captain Harry Dennison was wounded and died. Harry is commemorated on the Menin Gate. 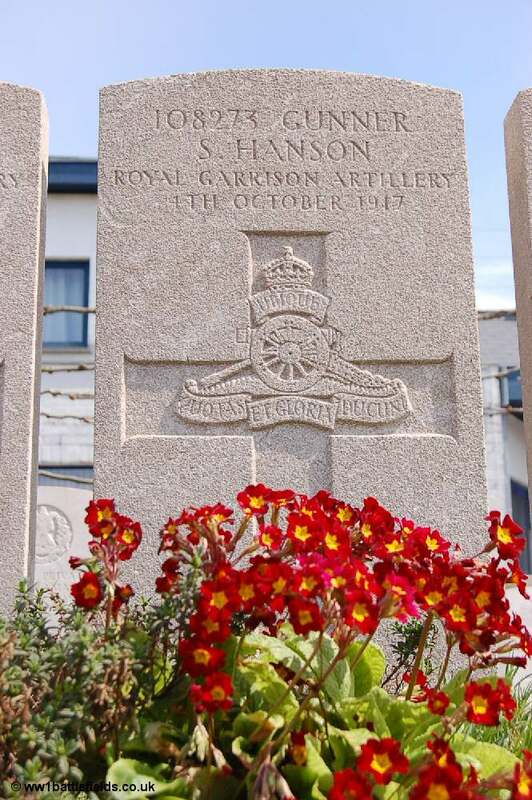 Sadly his only brother Lieutenant Ralph Dennison, serving with the 5th Royal Sussex, was killed the same day. Ralph (the older brother) also has no known grave and is commemorated on the Le Touret Memorial to the Missing. The PPLI War Diary records that after May the 8th, 93 men were killed, with 79 missing and 203 wounded. 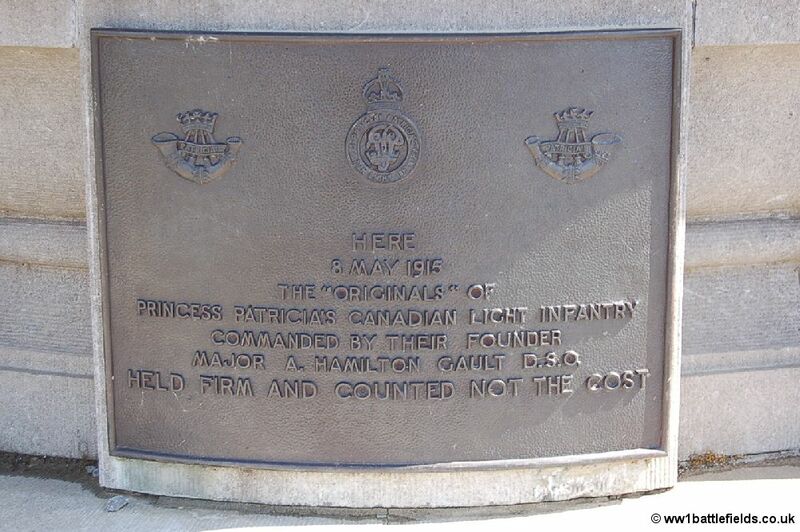 A plaque on the front of the memorial records that ‘Here, 8th May 1915, the “Originals” of Princess Patricia’s Canadian Light Infantry………..held firm and counted not the cost‘. Heading back towards Ypres on the N8, on the left and side of the road is Birr Cross Roads Cemetery. Trained trees line the edges of the cemetery above the walls, with interlinked branches. 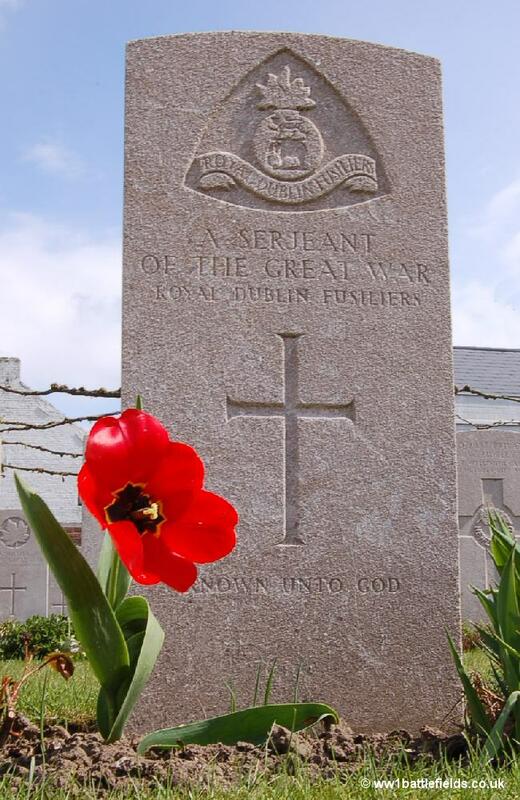 The cemetery was started in August 1917 and by the Armistice consisted of just nine rows of graves which are now part of Plot I. Other graves were concentrated here after the Armistice; from other cemeteries and also isolated burials on the battlefields around. There are special memorials at the front right of the cemetery to men believed or known to be buried here, the location of whose graves is now not known. Among these is a Victoria Cross winner, Captain Harold Ackroyd (below right). Harold Ackroyd served with the Royal Army Medical Corps, and was attached to the 6th Royal Berkshires in 1915. He had performed with noted bravery on the first day of the Battle of the Somme in 1916, when the 6th Royal Berkshires were in action at Montauban and later at Delville Wood. He was recommended for the Victoria Cross after Delville Wood, but was instead awarded the Military Cross. At the start of the Battle of Passchendaele (Third Ypres) Ackroyd worked throughout the 31st of July and the 1st of August 1917, tending to wounded soldiers in the front line. He carried a wounded officer to safety whilst under fire and went out in front of the lines under sniper fire to rescue another man. 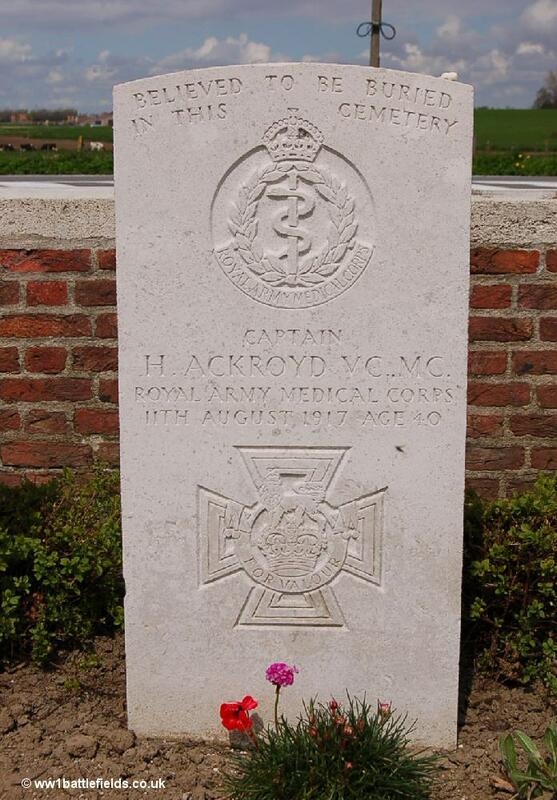 After this, Ackroyd was aware he had again been recommended for the VC, but sadly was killed only a few days later at Glencorse Wood where he was shot in the head by a sniper. He was awarded the VC, but this was posthumous. There are many Australian soldiers buried here, and one of those whose grave was moved here after the Armistice was Private Leslie Hogan of the 2nd Battalion. Hogan, from New South Wales, was an 18 year old postal assistant when he enlisted in January 1916. His service record demonstrates the strict discipline enforced during the war. On the 3rd of January 1917 he committed the crime of “losing Government property” – he left his boots in the support trenches. For this he was awarded seven days of Field Punishment No. 2 and ordered to “make good the loss”. A month later he suffered from frost-bite, and had to be sent to England for treatment, only rejoining his battalion a month before his death. He was killed in action on the 17th of September 1917. 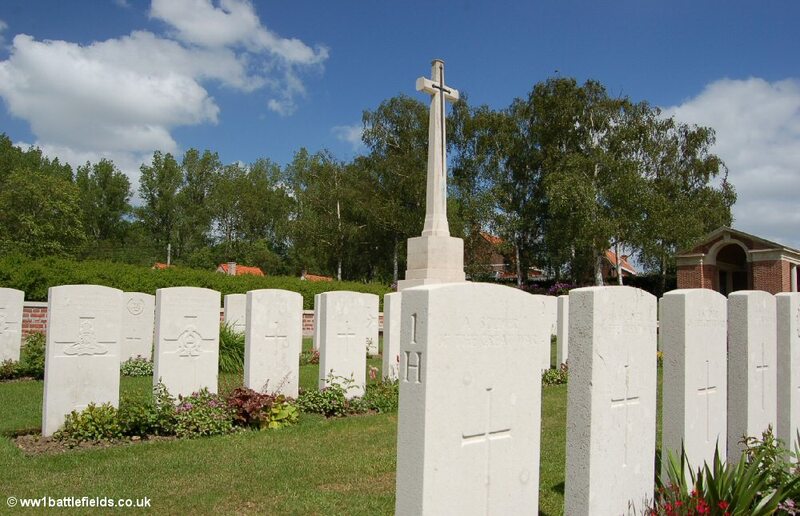 A note in his file reports that his remains were exhumed from a spot about mid-way between the sites of Birr Cross Roads Cemetery and Hooge Crater Cemetery – originally he was buried just behind the British lines on the north side of the road. Overall, 833 Commonwealth servicemen of the First World War are buried or commemorated here, with 336 being unidentified. As in so many of the CWGC cemeteries, the standard of care for the cemetery is exceptional; this is a fitting tribute to those who died in the Great War.